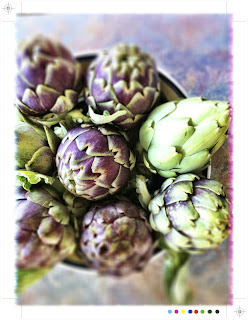 Artichokes...such beautiful looking vegetables. It looks like a big thistle but is actually an unopened flower bud and underneath all those hard outer leaves lies the tender and delicious heart. 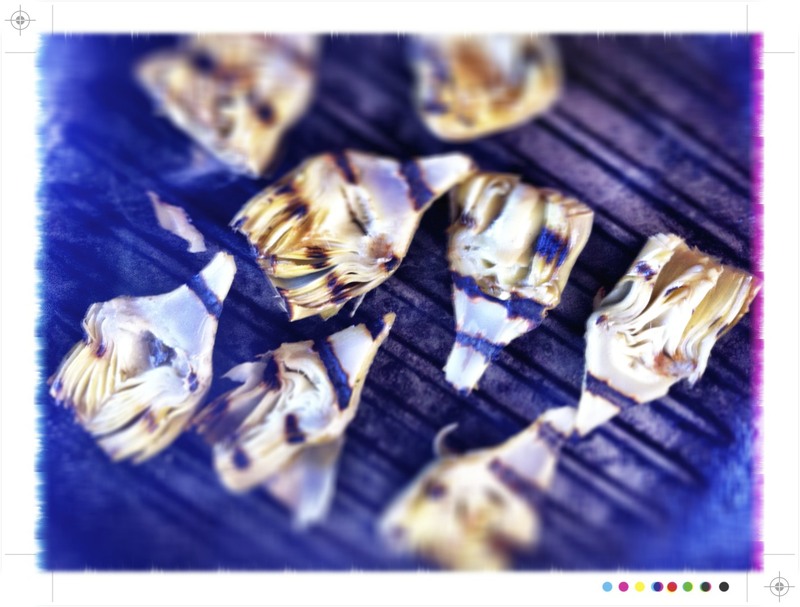 Apparently if you are a real artichoke aficionado you may hunt out artichokes with a little bronzing. This is called winter bronzing and happens after a frost. It is said that this improves the flavour. And apparently another way to know if they are fresh; rub the leaves together and they will make a squeaking noise. I read about his after so I can't attest to the veracity of it, I will just live in hope that artichokes make another appearance in my veggie box this week. *Snap back the tough outer leaves and pull down, working your way around the layers. Stop when you get to the pale yellow, tender leaves. Cut off the tops of the remaining leaves, leaving 2cm or so of leaf. Use a paring knife to trim away the dark green areas along the base and trim off the base of the stem end. Cut away any tough fibres around the stem, leaving just the light coloured tender bit. 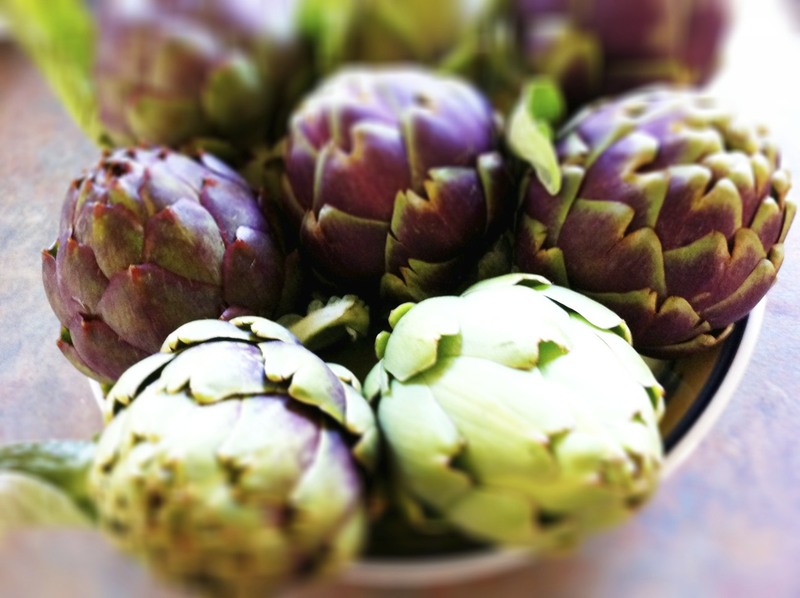 For larger artichokes cut the artichoke in half lengthwise and using a paring knife carefully cut away the fuzzy choke. Try to cut just at the point where the choke and heart meet. 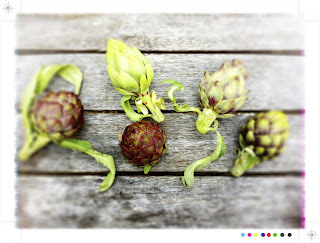 Mine were baby artichokes so hadn't yet developed a choke so are fine left whole. When trimming artichokes have a bowl of acidulated water on hand (just water with some lemon juice added) and rub the cut surfaces with half a lemon and place in their acidulated bath until you are ready to use them. Fill a medium bowl with water and the juice of half the lemon, throw in the lemon too. 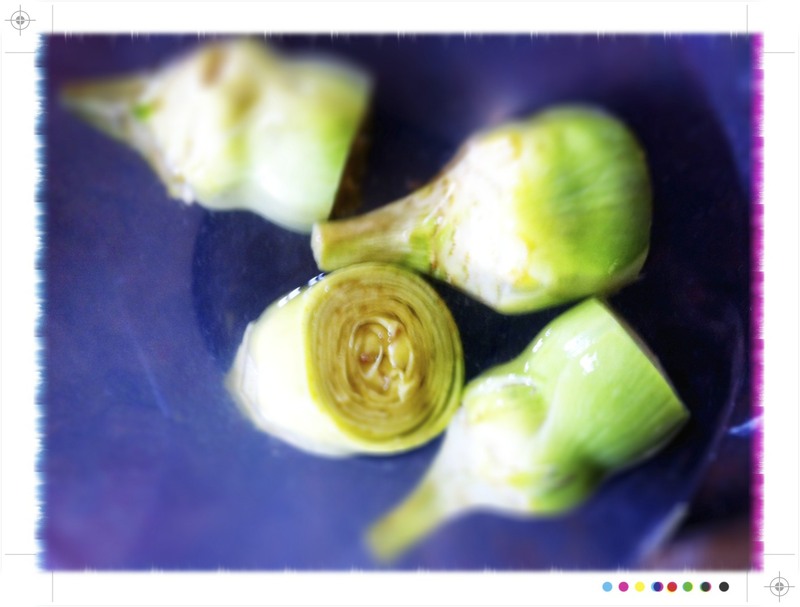 Trim the artichokes as above and place them in to their lemon water bath. The lemon will stop the artichokes going brown. I had small artichokes so left them whole. 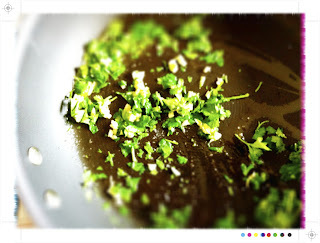 In a shallow pan add the chopped mint, parsley, garlic and olive oil. Add the artichokes and just enough water to cover them. Cover to keep them submerged, bring to a boil over a high heat ans then reduce the heat and simmer for 20 minutes or until the artichokes are tender. Maybe a little longer for larger artichokes. Drain and let them cool. For the grilling fire up the BBQ or heat up a griddle pan. 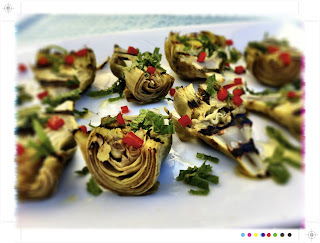 Place the artichokes cut side down over high heat and leave them to grill for a couple of minutes to get some nice charring. Turn over and cook the other side for a moment or two until browned. Place the artichokes on a platter and sprinkle with the mint, chillies, a drizzle of good olive oil and a scattering of sea salt. Serve immediately. These were lovely, so incredibly pretty flecked with bright red chilli and the fresh green mint. 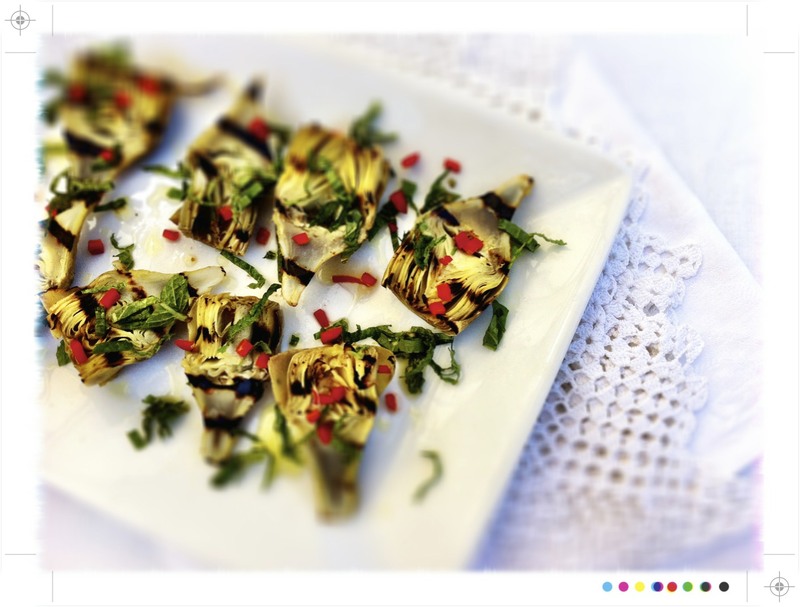 Melt in your mouth artichokes, a little heat and a little freshness....a perfect and ever so pretty appetiser for Summer. 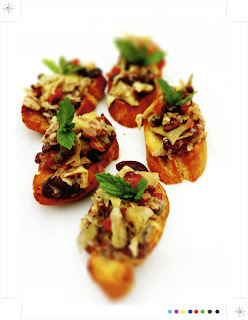 Bruschetta with Artichokes or Bruschetta al Pesto di Carciofi, adapted, ever so slightly, from Viana La Place's Verdura, a favourite vegetable book of mine. 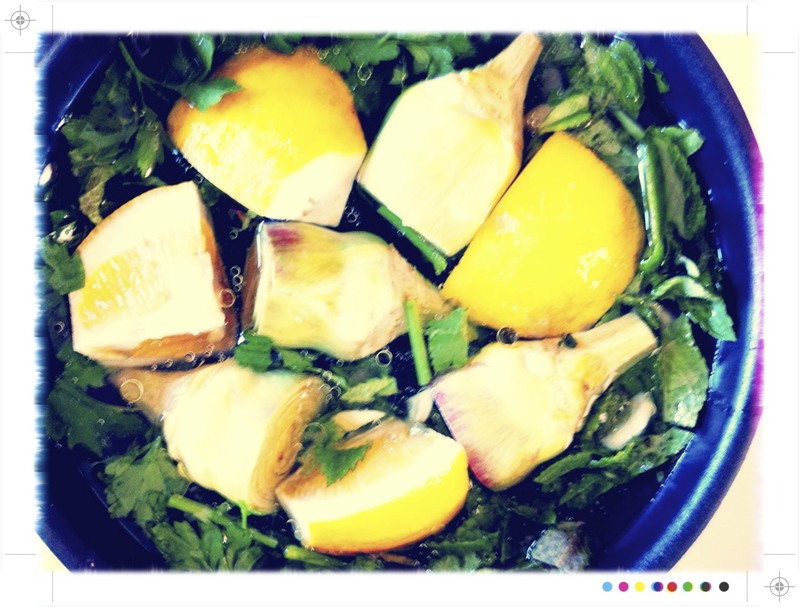 Squeeze the juice of half a lemon in to a medium bowl of water and add the artichokes. You just need a bowl large enough to hold the artichokes. Meanwhile in a medium frying pan add the olive oil, garlic, parsley, pinch of salt and then add the artichokes. Add enough water so that when covered the artichokes will be submerged. Cover the pan and cook for 20-30 minutes until the artichokes are tender. Timing will all depend on the size of your artichokes. 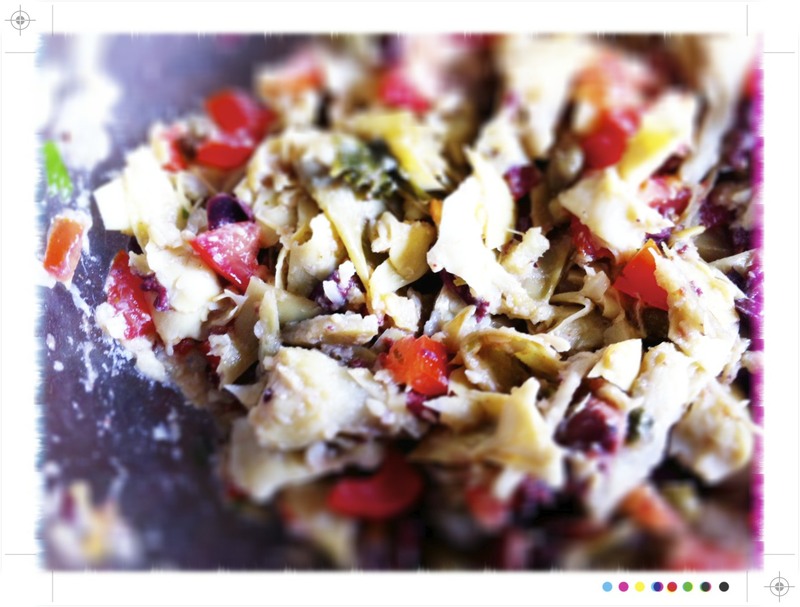 Scoop out the artichokes and place in a bowl. 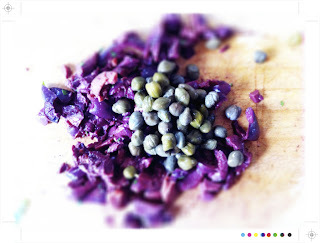 Coarsely mash with a fork and then stir in the capers, olives and tomato. We are going for rustic here so no need to be to fussy about it. Allow it sit for half an hour or so to allow all the flavours to meld together. For the bread cut a baguette on the diagonal in to 2cm / 1 inch thick slices. 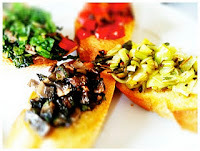 Cut a garlic clove in half and rub each slice of bread with the garlic, drizzle with olive oil and place on a baking tray. Bake in a 180C / 350F for 5 -10 minutes, depending on the efficiency, or lack of, of your oven. Keep an eye on it as it can quickly turn to incinerated rather than toasted. Top the bread with the artichoke puree, a little mint and serve. This was quite delicious. I love how all these simple ingredients come together. A rich herby, rustic topping for bruschetta with a lovely briny hit from the olives and capers and the addition of a little mint provide a bright freshness. It would also be good spooned over grilled chicken or fish or even stirred through some pasta. 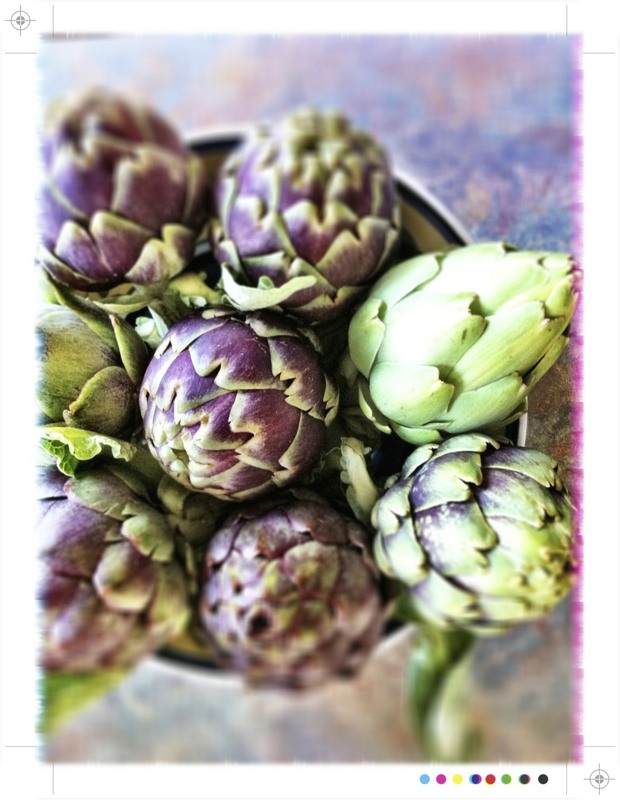 Beautiful Beautiful artichokes - where did you get them? I love photo #3 - stunning on a kitchen wall! These look lovely! So simple but just beautiful. Great photos too :) I have never been brave enough to try preparing artichokes but might try now! Mairi, the photos are stunning! I just love, love artichokes and wonder sometimes why I do not grow them when they are so beautiful to begin with! I am having total vegetable envy right now. Artichokes are still to arrive down here yet - I've been asking for them at the market and supermarket, but still no sign of them. Maybe this week ...! They are definitely worth the effort, and a real bonus is that since my better half is not that fussed on them, I get to eat them all myself. 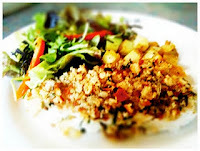 Hmmm, love your recipes and photos here! Artichokes are just wonderful. You're inspiring me to get creative - often we just eat them steamed and dipped in melted butter with lemon. @peasepuddingha ha...actually didn't find i too bad, a lot less scary than I thought it would be. @Vanessa and Ingrid Opera Thank you! They were so pretty...dozens of pics taken! @timeforalittlesomething.com You should...wasn't difficult at all, I was most surprised & very happy I have done it now. @my wedding Thanks for stopping by & for your kind comments. @Annapet Thanks Annapet :) So beautiful and then we throw most of it away!! @Hannah Thanks Hannah, steamed and dipped in butter & lemon sounds heavenly.